Gary Lee Fisher, 70, of Milan passed away Monday, July 9, 2018 at Stein Hospice Care Center, becoming ill after serving two tours in Vietnam. Gary was born on January 18, 1948 in Portsmouth, OH to the late Orville, Jr. and Gladys (James) Fisher. 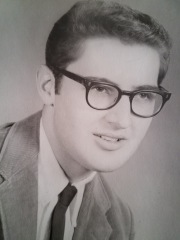 Gary graduated from Milan High School as a member of the class of 1966. He served in the military for 19 years in the Army Security Agency. He was an American soldier who devoted his life to serving his country and everyone's right to uphold the United States Constitution. Gary was a member of the Milan Baptist Church, the Intellectual Order of Geniuses in the United States (MENSA), and the National Rifle Association. He was an amazing artist who was incredibly talented in many different facets of art. Gary was also known as a prankster who enjoyed making other people laugh. Despite all he had been through he remained steadfast in his beliefs, his patriotism and his love for his country. Gary is survived by his loving sister, Linda (Nick) Burch of Milan, OH; niece, Heather (Jim) Petersen of Findlay, OH and nephew, John Cook of Oklahoma; Uncle John (Mary Ann) James of Firebrick, Kentucky, Uncle Bill (Carol) James of Castalia, Ohio and Aunt Betty James Minford, Ohio. He is also survived by many loving cousins. Friends and family may call on Thursday, July 12, 2018 from 4 pm to 7 pm at Groff Funeral Homes & Crematory Milan Chapel, 1 South Main Street, Milan. Funeral services will take place in the funeral home on Friday, July 13, 2018 at 11 am. Burial will take place at a later date at Ohio Western Reserve National Cemetery. Those wishing to contribute to Gary's memory may do so to The Wounded Warrior Project, PO Box 758516, Topeka, Kansas 66675-8516.